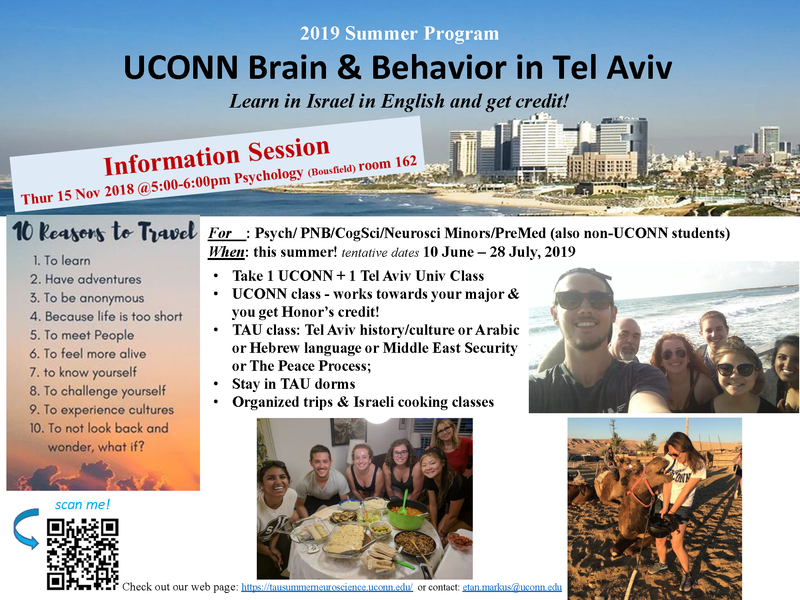 UConn Brain and Behavior in Tel Aviv is a summer study abroad program that provides students the opportunity to pursue their studies in Psychology, Cognitive Science, Neuroscience, PreMed, or PNB in Israel. The program is led by Dr. Etan Markus (UConn Psychology) together with colleagues at Tel Aviv University. Participants will take a UConn psychology class supplemented with a second, Tel Aviv University, course focused on regional history and/or culture as well as organized activities, tours, and an Israeli dinner/cooking class. There will be an information session on Thursday, November 15, 5:00-6:00 pm in Bousfield 162. This entry was posted in Study Abroad Opportunities.